Urban and rural stakeholders continue to work together to determine the right combination of practices needed to form an integrated system that best meets local watershed and priority resource needs. 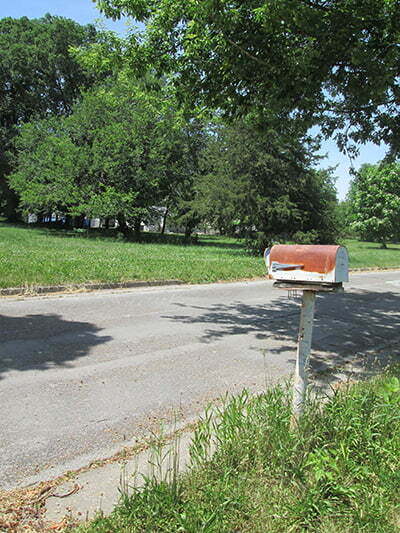 A rusty mailbox is all that remains on a house lot on a nearly abandoned street in Des Moines. It marks one way the city has tried to deal with flooding that forced hundreds from this stretch of the Fourmile Creek flood plain in 2010. Since then, the city has torn down more than 50 houses in the southeast Des Moines neighborhood. Local, state, and federal funds paid for voluntary buyouts. Jonathan Gano, the city’s public works director, doubts he’ll ever find the money to buy every business or home in this area that seems to flood more frequently than it used to. The likelihood of downpours like the 3.7-inch rain that surged down the creek on August 11, 2010, appears to be increasing with more cases of extreme weather. Building levees high enough to protect the neighborhood is also out of reach at a time when the U.S. Army Corps of Engineers is rejecting proposals for other urban areas in the state. “There’s a limit to what you can do with traditional methods and they’re all expensive,” he says. Des Moines is working with other cities in the watershed to use local, state, and federal grants to build or restore ponds and wetlands upstream. The goal of a watershed management plan released in April of 2015 is to be able to retain 1,200 acre-feet of water. That’s enough water to cover almost two square miles with water one-foot deep, or about 400 million gallons. “We firmly believe that one way to reduce this flood risk is to work outside of our jurisdictional boundaries and up in the watershed,” Gano says. The city is joining with USDA’s Natural Resources Conservation Service and the Polk County Conservation Board to reach out to landowners. They will be compensated for building ponds and wetlands by the city, NRCS programs, and grants from the Iowa Department of Agriculture and Land Stewardship (IDALS). “It’s vital to keep water on the land longer upstream,” Gano says, “so that we’re not dealing with large torrents of water when it gets to Des Moines.” The city has already found seven or eight candidates for water retention sites. Fourmile Creek, named for the distance from the first bridge built over it to what is now downtown Des Moines, is actually 38 miles long. Its watershed stretches over about 120 square miles, making it a relatively small tributary of the Des Moines River. In several ways, though, Fourmile Creek is a microcosm of water management challenges facing the entire state of Iowa and the nation’s Mississippi River Basin. The 2015 watershed management plan divides Fourmile Creek into three subwatersheds. At the headwaters near Sheldahl and Slater, the northern third is typical of Iowa’s flat, glaciated cropland made productive by drainage tile. The middle stretch is a mix of farms, pastures, and suburbs, including the rapidly developing city of Ankeny. The southern stretch flowing through Des Moines to the mouth of the creek is urban and also hillier and subject to erosion. “Our purpose is to address the primary problem the watershed is handling—reducing flood risk,” Gano says. By taking a holistic approach across the watershed, many of the stream’s problems are being tackled at the same time. Gano points out that all of the government entities in the watershed are working together through one of Iowa’s first watershed management authorities (WMAs), formed in 2012. The Fourmile Creek WMA includes nine cities, Boone and Story counties at the headwaters, as well Polk County and conservation districts in each county. “The old methods of forcing floodwaters downstream with levees does nothing for water quality. The new watershed-wide approach does,” Gano says. Besides holding back floodwaters, those upstream ponds and wetlands will help settle out phosphorus tied to soil particles and will allow some of the nitrates to be removed. Des Moines’ goal is to optimize for natural approaches, which cost less and send cleaner water from Fourmile Creek into the Des Moines River. “We recognize that the water gets used by others downstream,” he says. “We see this as two sides of the same coin,” Gano adds. At the opposite end of the watershed, Amanda Brown, Project Coordinator for the Polk Soil and Water Conservation District, works on the other side of that coin--with farmers who are reducing nutrients flowing into Fourmile Creek and its tributaries. Iowa’s voluntary Nutrient Reduction Strategy calls for a 45 percent reduction in nitrates and phosphorus flowing into the state’s streams. “Most of our efforts are to get conservation on the ground,” Brown says. This includes planting cover crops like cereal rye that hold soil in place and scavenge nutrients in the spring and fall when corn and soybeans aren’t growing. Some farmers in northern Polk County and adjoining counties are in their seventh year with cover crops. She also encourages no-till planting. The combination of no-till and cover crops can build up soil organic matter, which holds water in soil like a sponge. Brown helps farmers get grants from the NRCS and from IDALS through its Water Quality Initiative program, and through the Midwest Agriculture Water Quality Partnership RCPP project, co-led by the Iowa Agriculture Water Alliance and IDALS. Some of that money also helps pay for bioreactors (a buried trench full of wood chips) and saturated buffers of grass along streams. 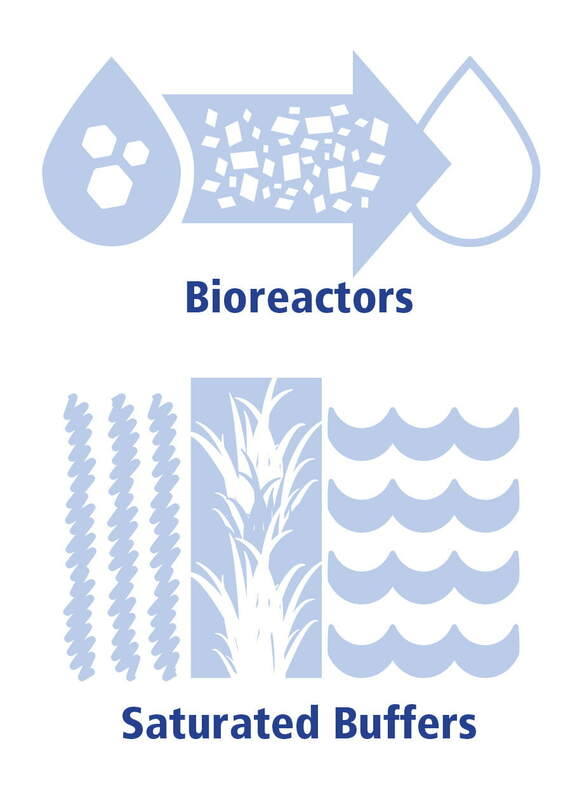 Both of these “edge of field practices” divert water from drainage tiles so that microbes on the wood chips or in the buffers’ soil can convert excess nitrates into nitrogen gas before they reach a stream. 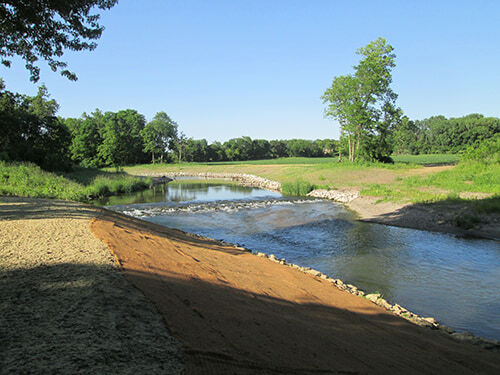 Most relevant, this work in central Iowa remains an example of how local leadership and partners are key ingredients to successful watershed projects. Urban and rural stakeholders continue to work together to determine the right combination of practices needed to form an integrated system that best meets local watershed and priority resource needs.